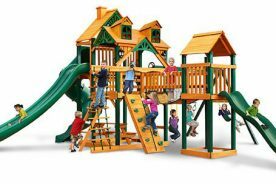 The Dayton Cedar Swing Set by Backyard Discovery is an affordable playset that is perfect for small yards where every square foot of space counts. 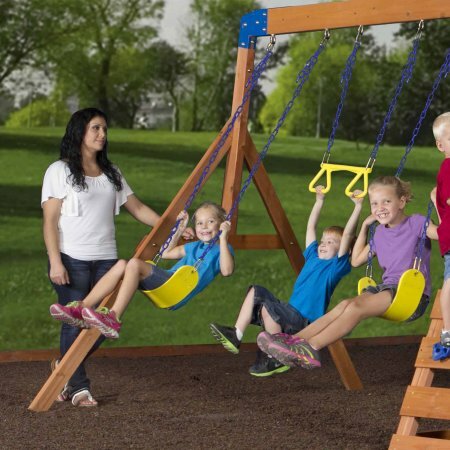 Kids will have a blast climbing, swinging and sliding on this compactly designed swing set. 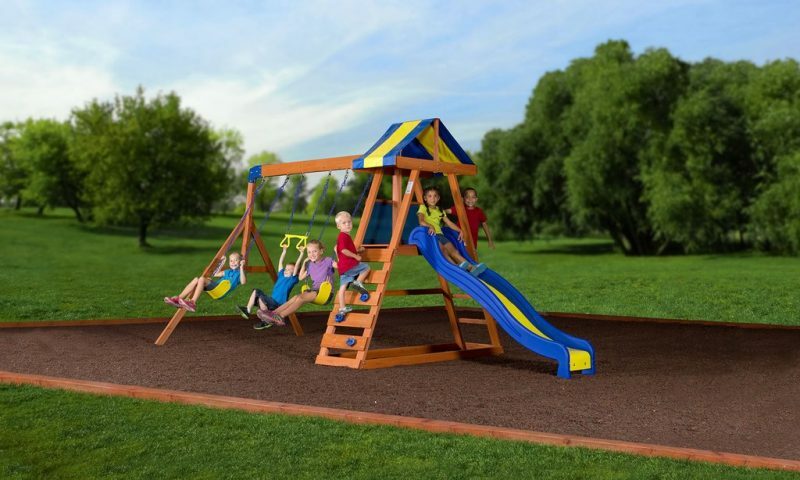 The Dayton Cedar swing set boasts many of the same features as bigger play sets, but a smaller design. 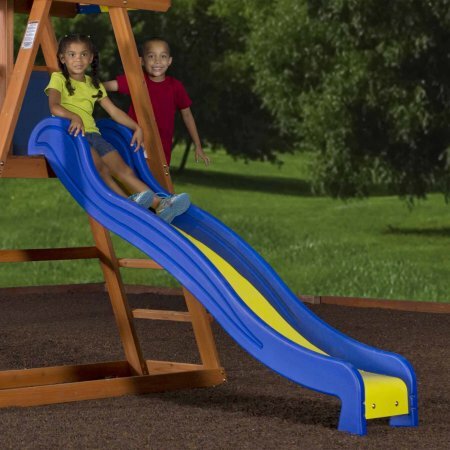 The play set has many safety features that make it great for smaller or accident-prone kids. The frame of the playhouse is angled for stability and adds interest to the design. The deck is 4 feet off the ground with a space of 55” long by 20” wide and a fabric canopy two and a half feet above the deck. That is plenty of room for a couple preschoolers or younger kids to hang out and check out the yard. There is a mesh sheet on one side of the deck for added safety. The best part of the deck is that there are two ways to enter and three to exit. Kids can climb the ladder or the rock wall if they want an extra challenge. To exit kids can zoom down the 8 foot super safe speedy slide or use the ladder or rock wall. On the underside of the deck is a sand box that holds up to 5 cubic feet of sand. Kids can build castles, make roads, and bury toys to their heart’s content. That is a great place for the sandbox because it is out of the way from the rest of the play. There are no worries about anyone tripping or running into each other. The deck is 4 feet off the ground so there is plenty of room for most kids to stand in the sand box without bumping their heads. This is key when one needs to bury ones feet. Opposite the playhouse is the swing beam that is 6 and a half feet off the ground. Two belt swings and a trapeze bar may be hung from the beam. It is recommended that no more than six kids, up to 120 pounds each play on the swing set at one time. With the swings, sandbox, playhouse and slide those six kids with be busy for hours. The swing set is made from 100% cedar wood. Cedar is a great wood to use outside because it is naturally resistant to rot, decay, and insects. The cedar wood that is used is free of added chemicals. A water-based stain has been applied for appearances. All lumber comes pre-cut and pre-drilled to make assembly a breeze. 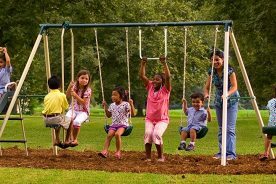 Knowing the size of your potential swing set is important when planning the placement in your yard. The Dayton measures 16 feet and 4 inches long and 7 feet and 5 inches wide. The swing beam is 6 feet and 5 inches off the ground and the canopy is the highest point on the swing set at 7 feet and 10 inches off the ground. You will also need to consider the added 6 foot safety zone around the swing set. This means the swing set should be no closer than 6 feet to all structures and obstacles such as houses, sheds, garages, clothes lines, fences, power lines, and trees. You also want to be sure the location you select in your yard is level. You will also need to consider the playground surfacing. It is not recommended to place the swing set on the grass or a hard surface. A hard surface increases the chances of injuries resulting from falls. Add mulch, shredded tires, sand, fine gravel, or wood chips as a shock absorber. You will want to add this material after you build your swing set, not before. You will also want to extend this surfacing out to the end of the 6 foot safety zone. If you are worried about the mulch getting spread all throughout your yard consider adding landscaping edging to the end of the safety zone to keep the mulch contained. You can learn more about swing set surfacing materials here. All Backyard Discovery swing sets come with manuals. In the manual you will find warranty information, recommended maintenance, frequently asked questions, and assembly instructions. The instructions are illustrated for every step of the build. The drawings are clear and easy to understand. Every part is drawn and labeled as well. This is very helpful when taking an inventory before beginning to build. 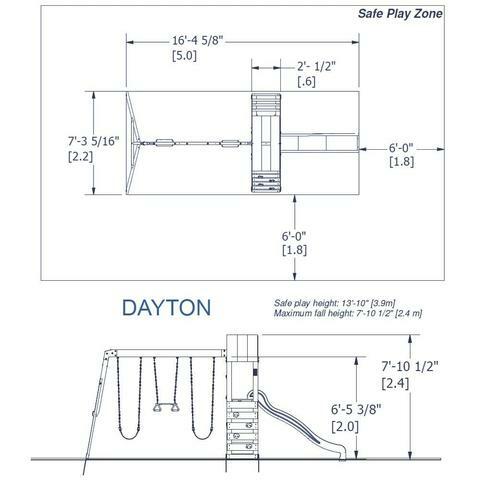 The Dayton swing can be built by two handy adults within 10-12 hours. To keep your swing set in good working order you’ll need to do a few things throughout the year. The most important thing you’ll need to do is re-stain the wood annually with some type of a sealant. This is a requirement of your warranty. 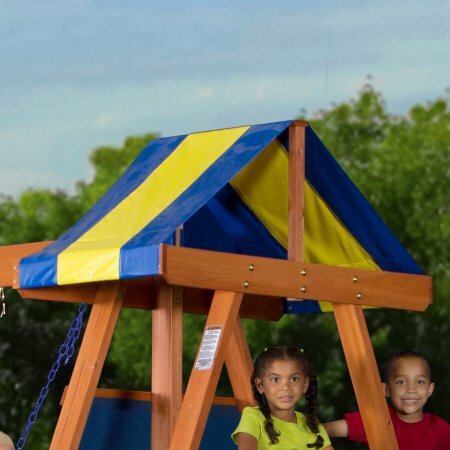 At the end of the first play season (or when the temperature dips below freezing) after you’ve assembled the playset you’ll need to remove the canopy, swings, and trapeze bars. These items will need to be stored indoors or in garage out of the cold. Check the depth of the surfacing and replace or rake if needed. You don’t want it to become compacted and if it gets tracked out of the area it might not be deep enough. At the beginning of each play season it is a good idea to tighten all hardware. You will also want to check the protective coverings on bolts, edges, and corners and replace or repair if necessary. The moving metallic parts will need to be lubricated. It is a good idea to give the whole swing set a once-over to check for wear, damage, cracks, or deterioration. If you find any splinters or cracks in the wood you can sand them down. Rust can be sanded off and re-painted. After you’ve done all this replace the swings, canopy, and trapeze bar and you’re ready to go. It is also a good idea to rake up the surfacing material and check the depth. 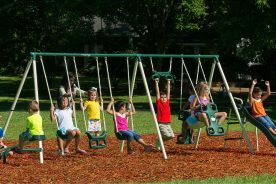 While your swing set is being used during the play season it is recommended to check the hardware and protective coverings twice a month. Lubricate moving parts and check for deteriorations monthly as well as rake the protective surfacing. All Backyard Discovery swing sets come with a limited warranty. 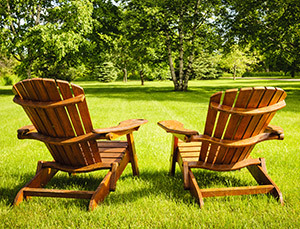 The limited warranty covers all parts for one year and the lumber for five years. If you are looking for a swing set to fit in your backyard and need one with a compact design the Dayton Cedar Swing Set is a great choice. With many of the same features of bigger swing sets in a smaller design it will be a great addition for your backyard with entertainment for your kids to spare.